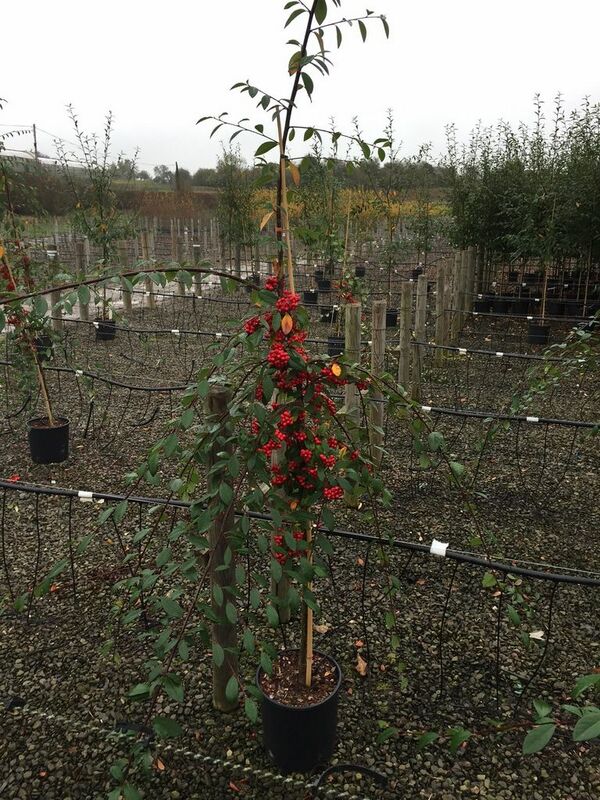 With its weeping branches (branches that point to the ground not crying), Cotoneaster Hybridus Pendulous is an ideal choice of small tree for year round colour and interest. The flush of white flowers in Spring add a great ornamental element to the Cotoneaster which is then followed by attractive red berries that last from Autumn to Winter. These are a great food source for the local wildlife but not great for human consumption as they can cause mild stomach upset if ingested. Not sure how to define mild upset but we guess it feels worse than watching Jeremy Kyle and better than a blow to the face. Expect a final height of around 2.5 metres but this is heavily dependent upon local weather and soil conditions. The harsher the environment, the slower and smaller it will grow. Cotoneaster Hybridus Pendulous can be planted in a wide range of soil types (chalk to clay and acid to alkaline) and will cope with harsh conditions which makes it suitable for UK planting almost anywhere. We have to say almost because there is bound to be someone that wants to plant it on an Army artillery range for some strange reason and wants the splintered and smoking remnants to be covered by our tree warranty. Technically an evergreen tree, this makes it a great point of winter interest for your garden. 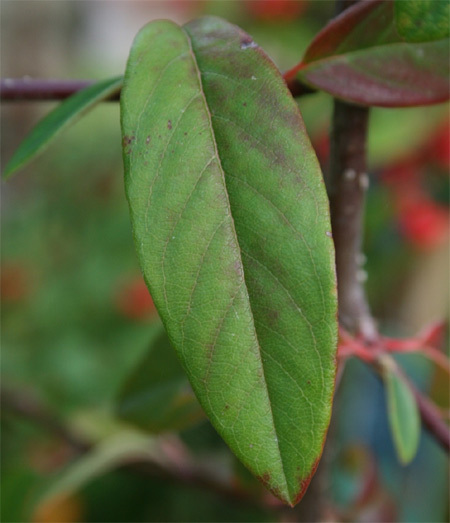 Cotoneaster Hybridus Pendulous is considered a drought tolerant tree which is ideal for those Southern locations with hosepipe bans being a regular occurrence. Cotoneaster Hybridus Pendulous is also suitable for coastal locations. We should mention that if you live that close to the coast that the beech gets closer to your back door every year then losing your tree in an overnight landslide is not covered in your tree warranty. We do get asked some odd questions. Our Cotoneaster is perfect for those that are unsure about pruning techniques as you can prune this as hard and as often as you like and it will bounce back. You can leave it to grow as nature intended if you prefer however removing dead, diseased or crossing over branches is considered a minimum standard of tree care. 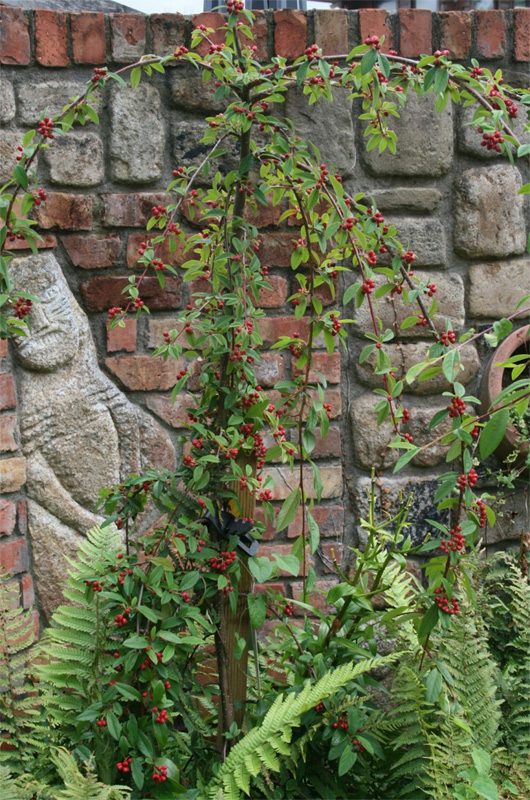 If you live in a particularly frosty part of the UK then you can still plant the Cotoneaster Hybridus Pendulous as it is considered to be fully UK hardy. 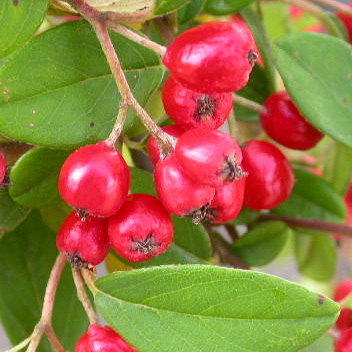 On the down side, if you have a particularly wet site then the Cotoneaster will not perform as well and may even die. Wet usually means standing water for extended periods of time. 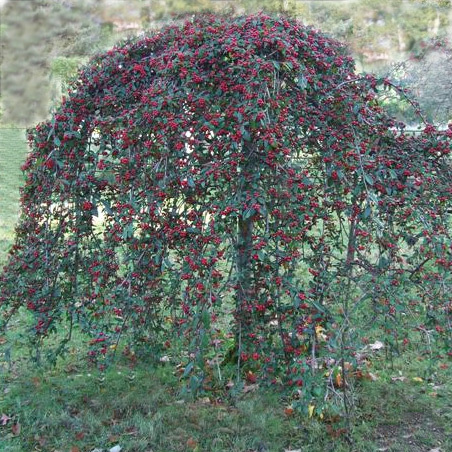 We will supply the Cotoneaster Hybridus Pendulous at a height of 1.5 to 2.0 metres tall and it can be planted any time of year although waiting until the ground is not frozen is a good idea. You can keep it in the supplied pot for for several months without issue but if you are going to keep in potted, we suggest moving it to a 20 litre pot for its next growing season going ultimately to 40 litres or more. If you are looking for hedging trees, then click COTONEASTER HEDGES or click COTONEASTER SHRUBS for smaller less expensive plants. Q) I purchased a tree from you 2 years ago but it has never flowered or produced berries. A) A very shady spot could cause this but Bullfinches are a well known culprit for eating the buds.